GAODETEC sand screen machine artificial use of the working principle of bevel sieve sand, the use of flat roller drum sieve, and to ensure that the material flow in the sieve cylinder multi-turn spiral blades can be more than five consecutive rolling sieve, the sand repeatedly tumbling, sliding And completely discrete and separated; different from the inclined screen caused by the size of the material pushing each other, burial pressure, the process of hurry screening; also different from the size of the inclined vibrating screen material vibration, mixing. Well designed, compact, easy to move and repair, replacing the bottom of the screen takes only 10 minutes. High efficiency, several times more than manual screening. 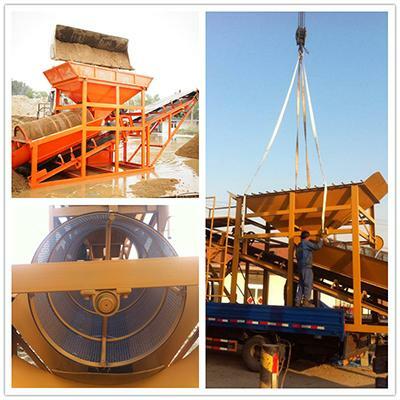 With such superior advantages, you can see our Chinese sand sieving machine is widely used in large-scale mixing station, construction site, battlefield, coal yard separation equipment.